Get hands-on practice in a live AWS environment with AWS services and real-world cloud scenarios. Follow step-by-step instructions to learn a service, practice a use case, or prepare for AWS Certification. Take a lab to get familiar with an AWS service in as little as 15 minutes. Learning quests lead you through a sequence of labs so that you can learn how to work with related AWS services. When you complete a quest, you'll earn a Quest Badge that you can show off on your resume, website, or LinkedIn profile. Whether you're new to AWS or keeping current with new services, introductory labs are a quick and easy way to learn the fundamentals. Try these popular introductory labs. Take your skills to the next level with fundamental, advanced, and expert level labs. Enroll in a quest - a collection of labs - and master a specific AWS scenario at your own pace. Complete the quest and earn a badge to share on your resume, website, or LinkedIn profile. Try these quests. How Labs Can Help You How Labs Can Help You! 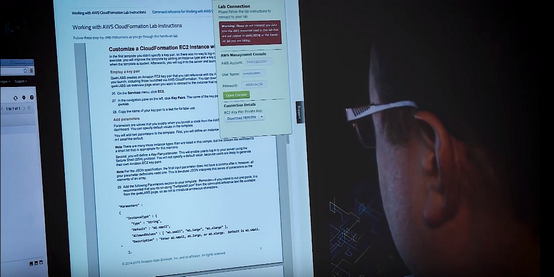 Watch the video to find out how others use labs to learn AWS.